OTTONI,artistic multiples. The democratic self-production of jewelery as multiples is expressed in the shapes and surfaces of the stick, hedgehog and circles collections made of brass, with a galvanic finish in gold, silver, white rhodium or black rhodium: multiply. 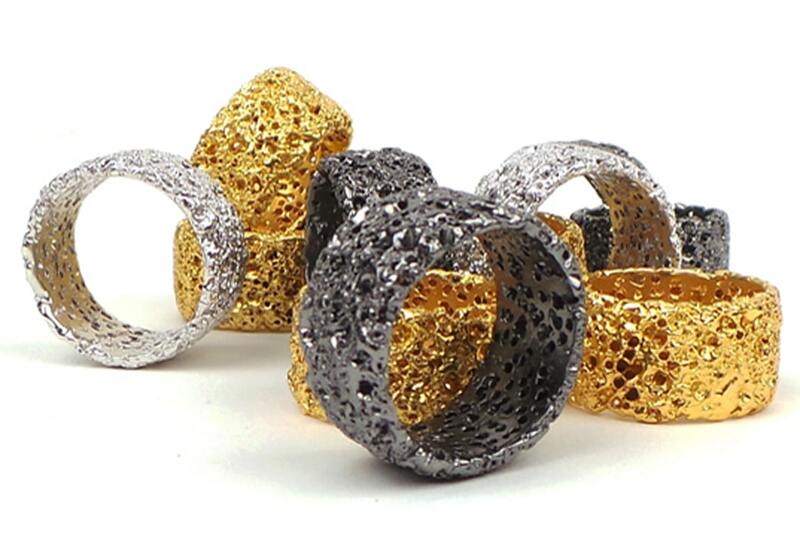 BLOB, rings with rhodium-plated silver structure, plastic, various materials, all unique pieces. Rings made of silver and colored plastic, incorporate micro-pop objects, such as mini coffee makers or motorcycles, animals or characters, with the omnivorous ability of the famous magma protagonist of the cult movie from which they take their name. Brooches with silver structure, steel, stainless steel closure, plastic, various materials. unique pieces. RIZOMI,earrings and rings with enamelled brass structure. In A Thousand Colors!